Asthma is a common and sometimes debilitating condition that affects millions of humans every day. You may not know, however, that it is also a common problem for many of our pets. The month of May is National Asthma and Allergy Awareness Month. Asthma can be a scary condition and, if left untreated, can cause life-threatening complications. It is important to know the symptoms of asthma and to contact Cypress Animal Clinic if you suspect that your dog, cat, or other pet may be suffering from the condition. Below are some of the signs that your pet may have asthma. Many animals pant when they are hot or fatigued because they do not have many sweat glands. This is perfectly normal and shouldn’t be cause for concern if it is only happening when expected, such as in hot weather or after exercise. But if you notice your pet panting heavily and for long periods of time, even with little exercise and in normal conditions, you should contact Dr. Thomas Dunn. Look for wide-mouth breathing as well as heavy chest movement. 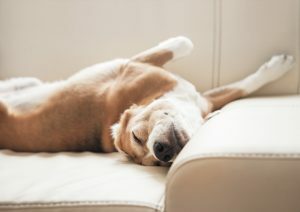 Due to a lack of oxygen, your pet may suffer from an overall lack of energy. This can include becoming lethargic and exhibiting intolerance to any significant amount of exercise. They may be unable to handle long walks or might even resist going for walks at all. If you notice that your pet has become unwilling to exercise as much as they used to, it may be time to talk to Dr. Thomas Dunn. Asthma is an uncomfortable and dangerous condition that affects many animals. Cats are more susceptible to asthma, but dogs are also known to develop the disorder. Pay attention to the signs for asthma, and if you suspect that your animal may be suffering from it, the best thing you can do is consult with Dr. Thomas Dunn.